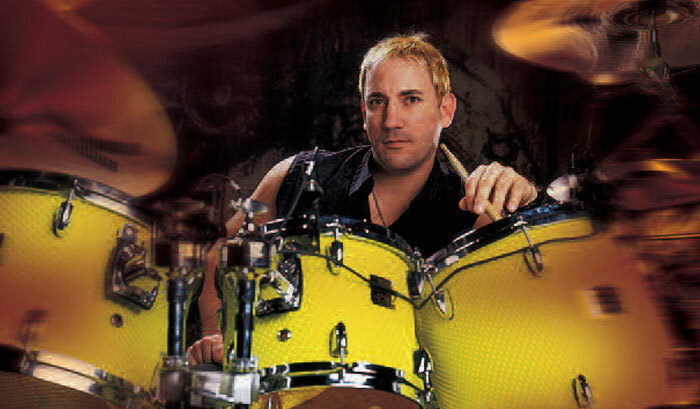 While bandleader Billy Corgan deservedly gets much credit for the Smashing Pumpkins' progressive-pop innovation, you can't overlook the contributions of drummer Jimmy Chamberlin. Chamberlin, who played on the Pumpkins' first three albums, rejoined the group for their fifth effort, Machina/The Machines of God. A recent chat proves that Jimmy remains one of rock drumming's true independent thinkers. Bred on big band. "Even though I'm a rock drummer," says Chamberlin, "I think I'm different for having been influenced by Benny Goodman, Duke Ellington, and other great masters of the '40s and '50s. I tend to be more of a tom-tom drummer than most rock players because of the influence of guys like Gene Krupa. I tend to avoid the kick/hat/snare thing as much as possible in favor of grooving on the toms." Ring's the thing. "I'm not a fan of the muffled metal drums of the '80s. I prefer ringy sounds, so I don't use any muffling except on the bass drum. Usually I tune my bottom head about a half-step higher than the batter head, trying to get some sort of tonal agreement between the two heads. I like the ringiness of the Yamaha Maple Custom Absolute set I'm using now. I used to use thickshelled Maple Customs, but these thinner Absolutes 'sing' a lot more." Bigger is not always better. Chamberlin tried a portable Yamaha Hipgig kit for the small venue gigs that preceded the Pumpkins' current world tour. "It was unbelievable!" he reports. "Obviously, the kit doesn't sound gigantic, but it's very pure, and it packs up so small, my drum tech could carry it onto a plane. Billy and I are talking about recording with it, because it's such a cool, different sound." Environmental activist. "The environment where you record the drums makes a huge difference in their tonal quality. We recorded in our big rehearsal studio, where we have a brick wall, a baffle wall with a drum riser against it, and a small control room. We used all three environments." Mystery miking. "We'd set up a bunch of floor toms in the middle of the room. I wouldn't play them - we'd just mic them to capture the way they'd ring in reaction to the kit I was playing elsewhere in the room. We'd add that ringing to the regular drum mix, bringing it in and out to add ambience and tonal variation. I've tried doing that before with older drum kits, but this was the first time it really worked, because only the Maple Absolutes have had the resonance you need for that effect." That's a wrap! "I really wanted the finish on my drums to look different. We found this amazing green hologram material, and I got Yamaha to make a wrapped finish with it. It doesn't make any acoustic difference - it's just a cool-looking kit."